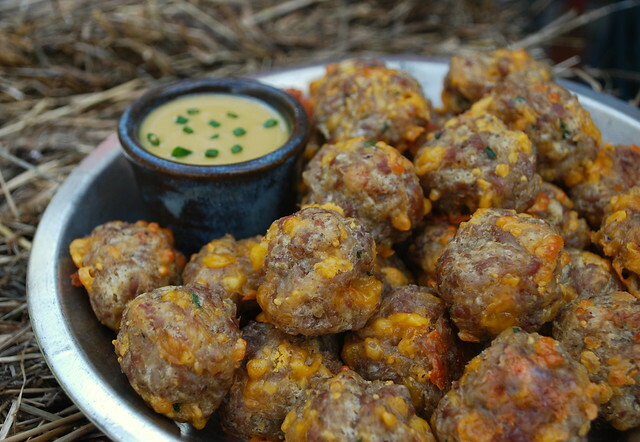 A few weeks ago there was much discussion on a food board I frequent about sausage balls. Apparently, these are a party staple in the South. Here, not so much. I mean I have heard of them. I think I've made them at one point a long, long time ago, but it's not usually one of the first things on my appetizer list. 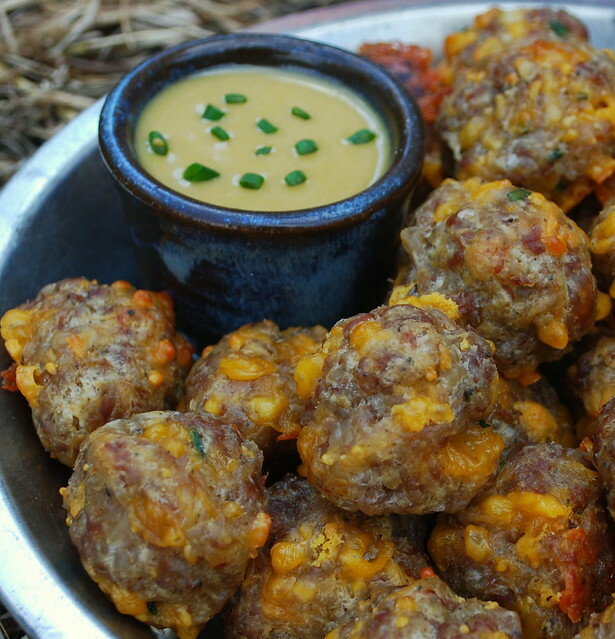 So I read through all the posts on these sausage balls and then I went and did a little Internet search on them. I scanned through a lot of sausage ball recipes and I finally decided that I was going to make up my own dang recipe. The first thing I noticed was that a lot of the recipes used a whole heckuva lot of Bisquick. I talking cups and cups full. I decided to skip the traditional Bisquick and use Bisquick's Cheese and Garlic Biscuit mix. It's sold in a little pouch near all the other biscuit mixes. I thought this might bring a lot more flavor to these and I was right. I fiddled about with the recipe and came up with what I think is the perfect biscuit to sausage ratio. I put a plate of these down on the counter and they were gone in minutes. I mixed up a little honey mustard sauce for dipping. Just use one part mustard to 2 parts honey. Mix and dip. If you are pressed for time you could also make these ahead of time, bake them and re-heat. They really were delicious. How about that....I have my own new recipe to share. Altering recipes. Creating your own. You're such a meddler ;-) And another 5 ingredient meal. How do I love thee? I still have the turkey meatballs printed out on the to-do list. I also have a recipe for Asian meatballs...maybe I'll just make it a meatball week. Can't imagine anyone would complain. You may have come up with the perfect breakfast for someone on the go. Think about it ... each serving provides some bread, sausage, cheese and egg ... what more could you ask for! I made your recipe this morning only mine were closer to the size of golf balls instead of walnuts. I had three for breakfast and rushed off to church. A lady sitting in front of me kept looking around and sniffing ... do you think it could have been the garlic? John I totally agree with you! It is the perfect breakfast food! I made these yesterday afternoon and they are yummy!!! I agree that they make great breakfast food...in fact I just had 4 of them @ 6am on this cold Central Florida morning. Thanks for all you give. I just had to come back to tell you that I made these again only this time I added a tiny manzanilla olive stuffed w/pimientos. I just drained them really well and dried them w/papertowels and rolled one inside of each sausage ball. Try it- you'll like it. That is of course if you like olives. We just made these and omg! Soooo good! Thanks for sharing! I bookmarked this page last year and keep coming back for the recipe. only changes I make are that I use sweet Italian sausage, and I experiment with different cheeses. I may try a Cheddar/Gruyere fusion this year. I recently posted my version on my blog, and linked your page as a reference for the original recipe. I make these all of the time, i actually came up with this idea as well before i read your post. i use alfedo sauce for dipping and it's a delicious combination with the cheese and garlic. I make these all of the time, I actually came up with this idea too before I read your post. I use alfredo sauce for dipping. The alfredo, cheese, garlic, bicuit mix and sausage compliment each other perfectly for a flavor rich appetizer. When I was at he grocery store Wally Work....lol I decided to get the cheese and garlic riskn a chance. Luckily I found your recipe and all my fear was gone:*)...Thanks for posting your..MERRY CHRISTMAS!! Wordless Wednesday~ Not so much.